Developing line of business applications as Eclipse Rich Client Platform applications presents a number of unique challenges. How does one validate data entry when the number of possible interactions between validation rules rises proportional to the square of the number of data entry fields on an input form? How does one avoid coding repetitive, dull, tedious, and error-prone SWT event handlers? How can one improve reuse of data-driven user interfaces? All of these concerns are improved upon by using JFace Data Binding. The communication paths between these tiers are organized along the routes that data flows within and among these tiers. Recently, Hibernate, EJB3, and Rails technologies have emerged as a means of automating the data flow between the business tier and the database tier. By analogy, just as Hibernate helps automate the data flow between the business tier and the database tier, JFace Data Binding helps automate the data flow between the business tier and the presentation tier. It does this via a simple update to the model-view-controller pattern that enables us to create a set of completely generic and reusable controllers between the business model objects and the view (or presentation) tier. The view observes (listens to) the model for changes and redraws itself when it detects a change. The controller observes (listens to) the view for change events. When the controller detects an event that needs to cause a change, it is responsible for mutating the model, which implicitly refreshes the view because the view is listening to the model for changes. The view has to understand the model. The controller has to understand both the view and the model. Data binding is a recognition that most of the time, Text widgets are bound to single properties of objects, a radio group has a java.util.List or a java.util.Set of choices and its selection is bound to a single property of an object, and so on. Since we know that the data type in the business model tier has to match the data type in the GUI widget, we can build a generic mapping layer between POJOs and GUIs similar to the way Hibernate is a generic mapping layer between POJOs and databases. The implementation is simple. 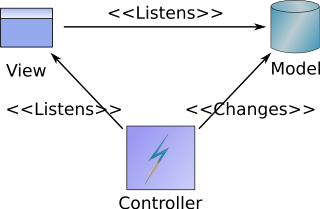 The generic controller represents data binding. It listens to changes on both the model and on the GUI view. When a change in a property occurs in the model, it is automatically copied to the GUI. Similarly, when the user changes a value in the GUI, the change is automatically copied back to the model. The data type of the model object is "int". The data type of the UI is "String" (the data type of the text property of the Text). The controller simply listens to the model for changes in the "numberOfYearsWithFirm" property. Similarly, it listens to the SWT Text object for changes the user makes in the UI. If the user changes the UI or the underlying model object changes, that change is copied to the other side, automatically applying any validation and/or data type conversion rules that are necessary to make the whole thing work. For example, if the user changes the SWT Text object, the new String value is validated that it can be converted to an "int", the value is then converted to an "int", and the new integer value is then set in the model object. This page was last modified 17:28, 16 July 2013 by Mike Rombout. Based on work by Boris Bokowski, Allan Shoup and Brad Reynolds.